M T D N o v e m b e r 2 0 1 8 42 M arketers across North America are obsessed with people who were born between 1977 and 2000. This generation, known as Generation Y or the Millen- nial Generation, makes up 25% of the U.S. population and 21% of consumer discretionary purchases — which translates to over a trillion dollars in direct buying power. ey are generally considered adven- turous, entitled, innovative, optimistic and self-absorbed, yet they still want to please others. Social issues and causes play pivotal roles in where they shop or work. Millennials have grown up more sheltered than any previous generation, as "helicopter parents" tried to shield them from every- thing that may cause the slightest physical or psychological discomfort. Everyone gets a trophy. Everyone is important and everyone has value. For the Baby Boomers and Generation X in the workplace, his generation is a puzzle without the box. We're pretty sure all of the pieces are there, but we're not confident we can put it together because we still don't have a picture of what it looks like when it's completed. Millennials tend to be wired differently, with an unprecedented level of dependence on technology. As a result, they also are 2.5 times more likely than previous generations to be on the leading edge of adopting new technology, according to U.S. Chamber of Commerce research. Bottom line, they don't believe in the rules that we were taught to follow, so we must adapt to their needs or avoid them at all costs. Work is a means to an end for them, and if a particular job doesn't fit into their schedule, then they might give up and find something else. Flexible hours and friendly environments are highly valued, while the typical 9 to 5 jobs of their par- ents and grandparents are considered less desirable (unless it supports the lifestyle that they want). 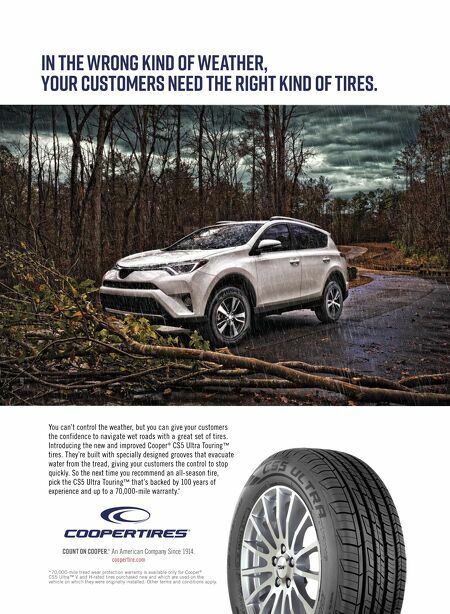 These are things every commercial tire dealer needs to keep in mind when planning for the future. Kevin Rohlwing By Why not Generation Y? There are plenty of millennials out there. 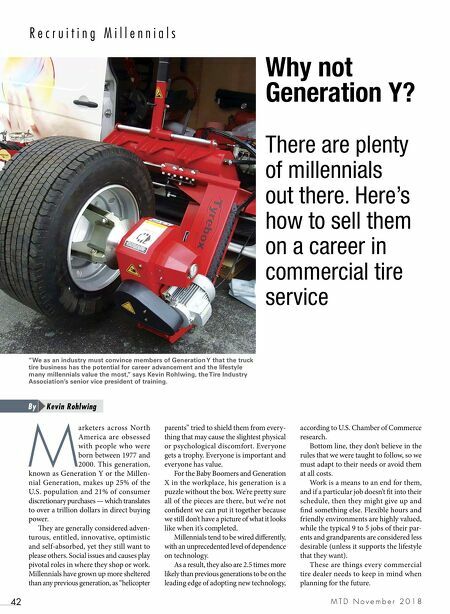 Here's how to sell them on a career in commercial tire service R e c r u i t i n g M i l l e n n i a l s "We as an industry must convince members of Generation Y that the truck tire business has the potential for career advancement and the lifestyle many millennials value the most," says Kevin Rohlwing, the Tire Industry Association's senior vice president of training.